We entered Guatemala on 29 August 2012 and drove from the border to Tikal National Park. Even after the Maya ruins at Palenque and Chichen Itza it was fantastic to see Tikal. Early morning at 3.30 we woke up and entered the park in total darkness. We could see the silhouettes of giant temples as we passed them on our way to Temple IV. 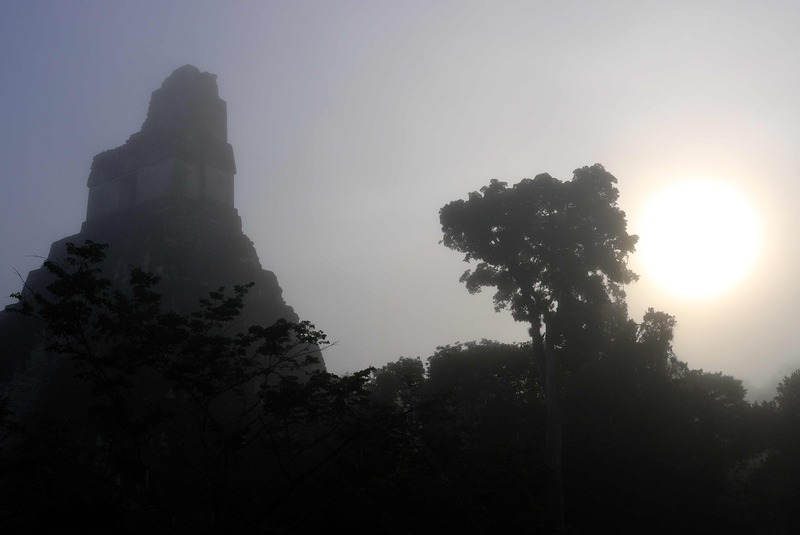 We climbed the stairs to the temple, which towers over the jungle 70 m tall, and sat there in silence, watching the darkness turn to a bluish misty dawn and listening to the loud growls of the howler monkeys as they woke up down below in the tree tops. Afterwards, we wandered through the empty park and marveled at the tall temples, which appeared out of the mist. As the sun gained power, the mist disappeared and we spent a couple of hours more enjoying the ruins, the jungle, the spider monkeys crashing through the tree tops over our heads and the hundreds of exotic birds like the toucans, the parrots/parakeets, the wild turkey and the wood pecker with the bright red head. There were very few other tourists and therefore plenty of opportunity to linger, relax and really take in the magical atmosphere of the site. From Tikal we drove down south to Coban. The city campsite was very empty and did not seem very safe (it is inside the Parque Nacional Las Victorias in the center of the city) so we decided to go to a hotel. And what a hotel! A little bit over budget but we enjoyed it a lot, we stayed at the La Posada very close to the main square. The next morning we visited Finca Santa Margarita, a working coffee farm in Coban. 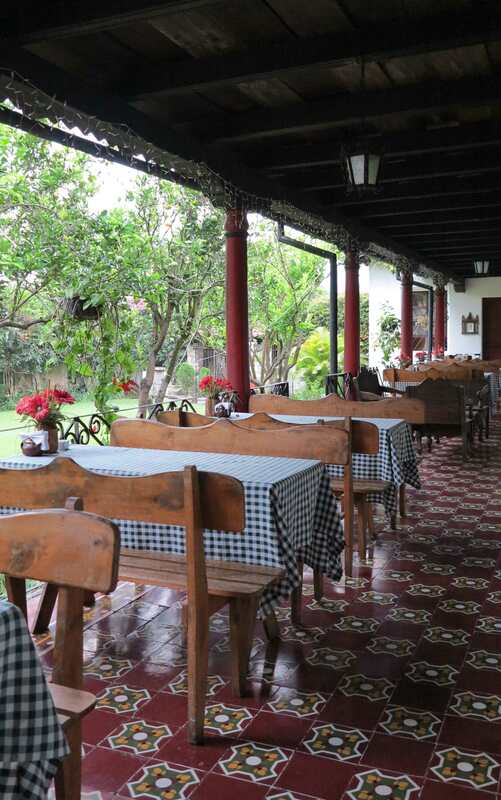 Like many of the coffee farms in the area it was founded by a German, Erwin Paul Dieseldorff, who came here in the 19th century and it is still run by 4 generations of the same family. We got a very nice tour of the farm with a full explanation of how the coffee was grown, harvested, selected, etc. And their coffee is excellent! From Coban we took the infamous “short cut” to Huehuetenango along the road 7W. A large landslide killed 58 people in 2008 and destroyed part of the road but it has since been repaired and it is now passable without any problem, even if it is a bit bumpy in places. The road passes through green hills, corn fields and small villages and the trip is an experience in itself. We slept outside a small restaurant along the road, it is run by a kind lady who took very good care of us. The next morning we continued to Huehuetenango. In 1993, 18 years ago, as a student and only with my rugsack and few money in my pocket, I was visiting Guatemala. I was jumping from one noisy bus to the other, visiting amazing places like Tikal, Lake Atitlan and meeting local people in the typical markets of Chichicastenango, Quetzaltenango, Antigua and Huehuetenango. When Malene and I decided to visit Guatemala on our trip around the world, I was very excited as I was sure that Malene would love the colourful local markets full of typical Guatemalan artefacts. Strongly coloured fabrics, carpets, blankets, clothes and a myriad of other things, everything made through hard work by the experienced hands of Maya women coming from small and poor villages in the middle of the jungle. After two fantastic days at the Maya ruins of Tikal, we drove through the villages of Coban and Sacapulas, part of the way on a dirt road, and finally arrived to Huehuetenango. As soon as we had found a place where to sleep and to park Frida, we jumped inside the heart of the city looking for the local market and the colourful experience we were expecting. We toured around for at least one hour but found only small shops selling Chinese garbage. We changed area, hoping for a change. No way. 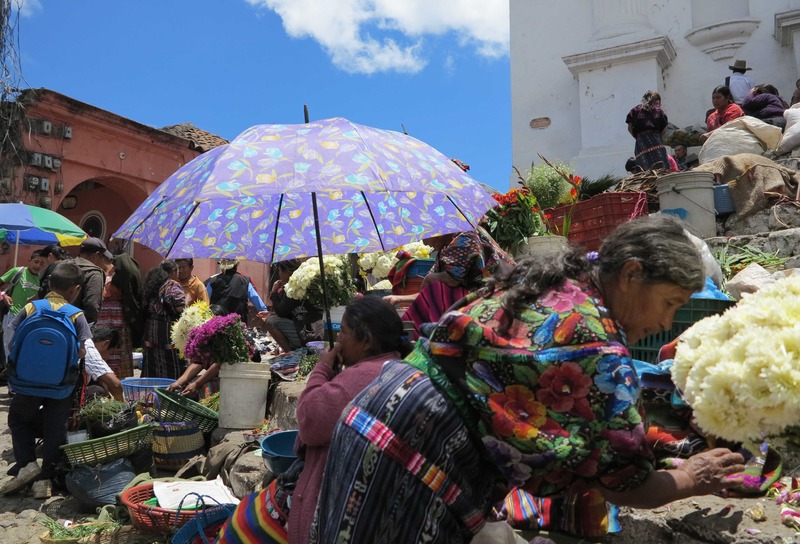 In the entire city the streets were full of Guatemalan shops selling Chinese products…no colors, no local artefacts, no small old Maya women selling their handicrafts, only plastic and bad quality. A delusion. We stayed in the Central Hotel, an old but charming place run by Victor and his mother. They were very hospitable, also because they allowed us to park Frida in the courtyard so we could sleep in our car! Victor is working in an association for the Guatemalan protected areas, including the conservation of nature, animals and cultures. He was the right person to ask what is happening in Guatemala. He explained us that in the last 10 years Guatemala has been “conquered” by the Chinese who are selling their cheap products and even worse, they are copying the traditional Guatemalan artifacts and selling them at 1/10 of the normal price. In this way, they have in just a few years completely destroyed the local trade. A shame. 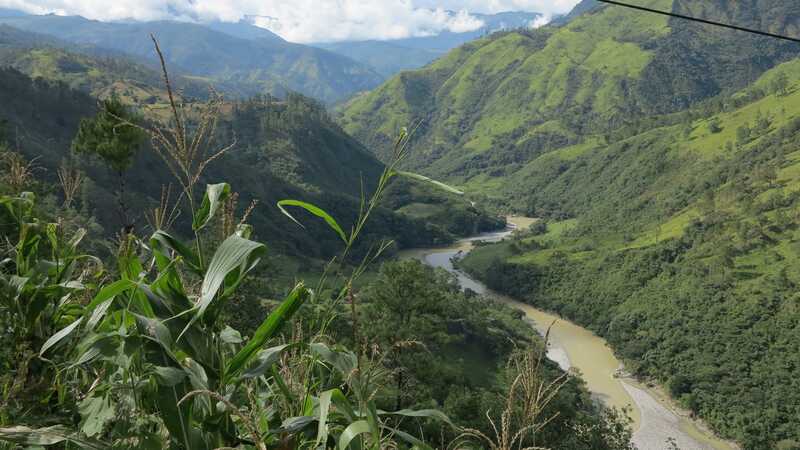 We have decided to move south to the cities of Quetzaltenango and Chichicastenango to see if the situation is better and if we can still find the old Guatemala I discovered almost 20 years ago. But first we will make a stop at Tajumulco in order to enjoy the climb of the Tajumulco volcano, 4220 meters high. Let’s see if we will be able to wake up at 1 am in order to be on the top at 5 am for the sunrise. They say it is amazing! 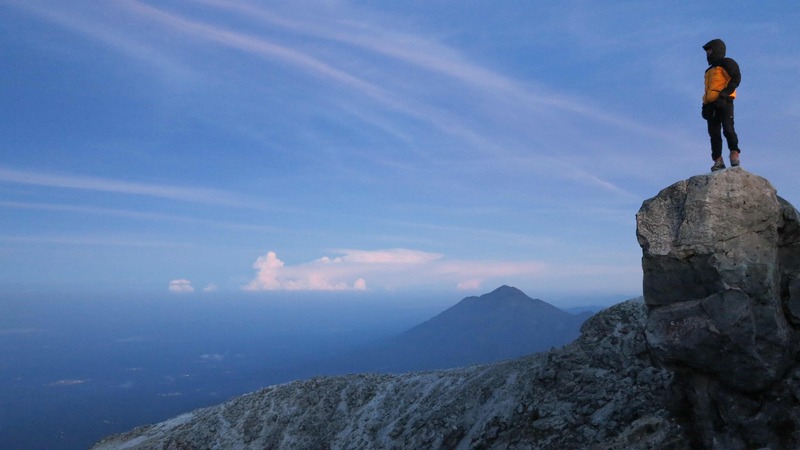 The Tajumulco volcano, 4220 m, is the highest peak in Guatemala and in Central America. The road to the volcano winds its way through small villages and green hills from the city of San Marcos until the beginning of the trail at “Cruce de Tajumulco”. The trailhead is at 3000 m so it is only a 1200 m climb to the top. We decided to climb it at night under the light of the full moon to arrive at the summit for the sunrise. 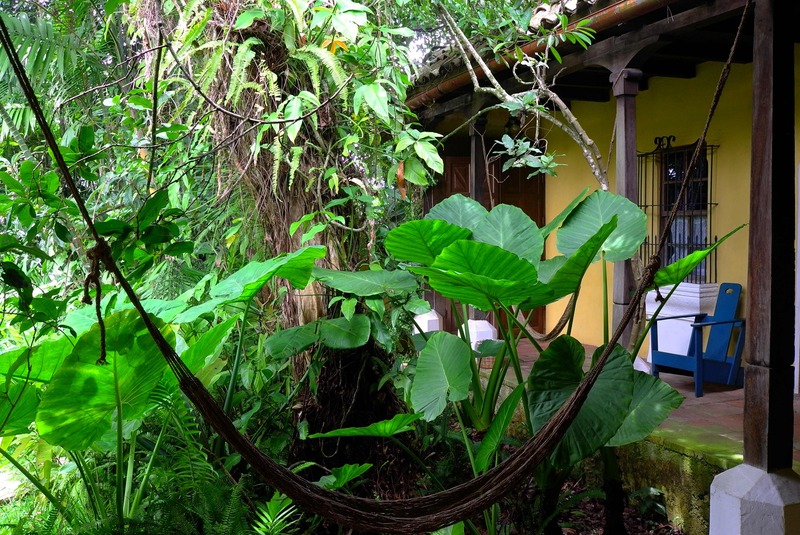 We stayed overnight close to the trailhead at a restaurant owned by a family from Nicaragua. After a tasty, fresh prepared meal of chicken, vegetables, beans, rice and tacos we went to bed at 8 pm. At 1 am we woke up, prepared everything and started walking at 1.30. It was a beautiful and quiet night full of stars and with a strong light from the moon. We did not even need our headlamps to see the way. The first hour of the trail is along a well-used stone/dirt road flanked by small farms, angry dogs and crop fields. We managed to fight back the dogs and made it to the beginning of the footpath at approximately 3300 m. The path diverges and converges through pine forest and meadows but even in the darkness it was not too difficult to follow. At approximately 4000 m we reached a small plateau with a couple of campsites and from there, the trail climbs up the steep sides of the summit crater to the top. We reached the summit at 4.15, a full hour and 15 minutes before the sunrise! Fortunately we had our big down jackets from Seattle to help keep us warm while we waited under the stars, watching as the horizon turned lighter blue, then pinkish and orangey before finally the full explosion in orange and yellow as the sun rose above the horizon. We had an incredible view to the valleys and villages below, to the neighboring Volcan Tacana and to the more distant volcanoes in the direction of Lake Atitlan. It was the first thing Luis said after we had put down our bags in the room at the Posada San Sebastian in Antigua. Welcome home! And now, as we are leaving Antigua and driving towards El Salvador, it feels like we are leaving our home and part of our family behind! We arrived to Antigua on Marco’s birthday. Actually we had planned to climb a nice volcano at Lake Atitlan for the celebration, but at the commercial travel agency/guide service where we went to ask information they said that it was too dangerous and that they had stopped taking clients there. Armed bandits were known to rob the tourists, even when a local guide accompanied them. So we concluded that this small volcano was definitely not worth it and we went instead to Antigua. And it was in Antigua that we found our home away from home. Honestly, we were a bit tired after 3 months of traveling. Not tired of traveling, but physically tired from the driving and all the jobs that comes with living life on the road. Still, we were planning on just 2 nights in the hotel, to celebrate Marco’s birthday in style and to recover a bit, wash the clothes and the bed sheets, organize the car, update the blog, and things like that. We ended up staying 5 nights and now as we are leaving we feel like we could have stayed for a lifetime. Antigua, Guatemala is a place where we could live! Luis is the owner of the hotel Posada San Sebastian where we found our home in Antigua. 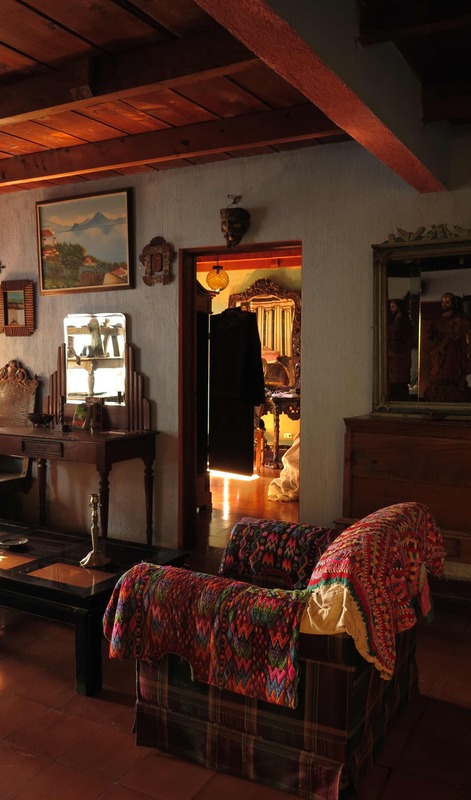 He has had the hotel for 30 years and it is full of antiquities, rarities and curiosities, many of them from his grandmother’s house. It is a very personal and special place Luis has created. But it is not the things that make a home; it is Luis and his staff! When we arrived we were welcomed by the owner of the hotel and when we left we said goodbye to a friend. Antigua is another Spanish colonial town, but it is special. The city council of Antigua got something right. They have banned the busses and big trucks from entering the old and beautiful city center and they keep Antigua clean and safe. Also the volcanoes around Antigua are safe to climb from the bandit point of view – we will write a separate report on that! Furthermore, Antigua is the former capital, which was relocated to Guatemala City after Antigua was seriously damaged in a major earthquake in 1773. But the architectural heritage of the former capitol is still there, rebuilt after the earthquake or left as magnificent ruins of grand churches and monasteries. We have to say that we spent our time in Antigua well: Already the first day we discovered the fantastic cakes being baked at the Dona Luisa Xicotencatl and therefore, exercising constant care and with a strong sense of urgency, we managed to eat our way through 3 different kinds: The banana cake, the orange & chocolate cake and the lemon cake. It was hard but it was definitely worth it! Another thing we discovered was a hidden gem of a local restaurant, a bit on the edge of the city center, where they made incredibly tasty local food, which was served on the covered terrace with a view to the garden. And Antigua is like this: Touristy, but not too much, it is still very much a vibrant, living Guatemalan town with unique places and special things to discover for the visitor. If you are going only one place in Guatemala, go to Antigua! Since our last post from Volcan Tajumulco, we went through Quetzaltenango and Chichicastenango on our way to Antigua. We did not find Quetzaltenango to be anything special but we enjoyed visiting the fair trade shop for local handicraft products. Most of the fabrics and products we have seen in the markets are made with cheap colours, which will run the first time you wash them. The products, which they sell at the fair trade shop are made with higher quality threads and better colours. A few products are even made with naturally coloured thread, very beautiful! In Chichicastenango we went to the famous market to have a look at the local products. We bought nothing since the fabrics we had seen at the fair trade shop in Quetzaltenango were much nicer and of higher quality – and significantly higher price but worth it! Nevertheless, it was an experience to just walk around the market, buy some veggies and have a look to the busy market life. Have a look to the pictures for a taste. 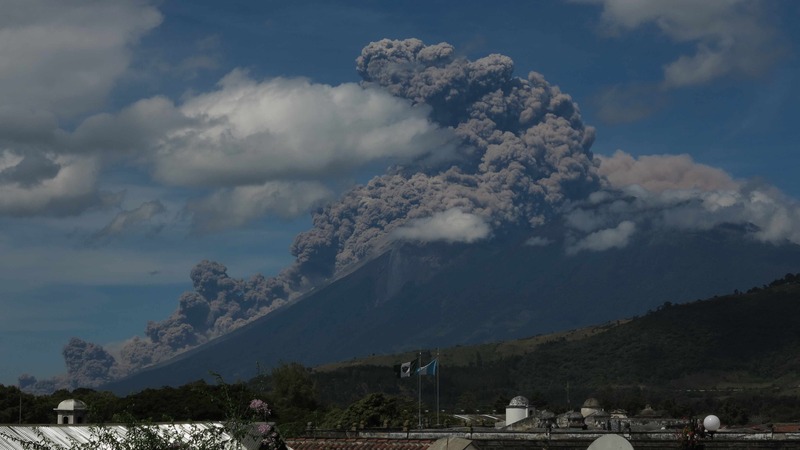 Now we are in El Salvador, checking the internet for updates on the Fuego eruption which we witnessed this morning from the roof terrace of the hotel in Antigua. Impressive! What a grand farewell salute! 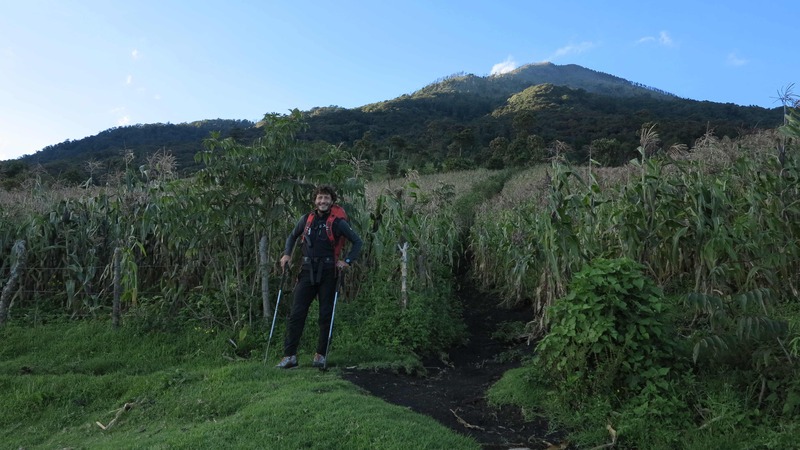 Our first attempt at climbing the Acatenango volcano ended in frustrating failure! After climbing 1100 m up a very steep path, we realized that we had ended up on the wrong trail in bad weather and we had to return to the base. Two days later we gave it a second attempt and made it to the top. It is a fantastic hike and very easy – if you can find the right trail. The views from the top are world class. See the end of this text for a precise trail description. Volcan de Fuego on a quiet day, seen from the summit of Volcan Acatenango. First attempt: The alarm clock rang at 5 am and we jumped out of bed, eager to go and climb the volcano Acatenango, just outside Antigua. The clouds were hanging low but we were hoping that it was just the morning mist and that later in the day we would be able to enjoy the brilliant view from the top of the volcano. The best route to climb Volcan Acatenango, 3976 m high, starts from the small village of La Soledad just north of the volcano. It takes about an hour to drive there, half of the way on a quite destroyed dirt road, but with Frida it was no problem. Arriving in the village we found good parking by a small kiosk and the old guy of the house told us to go back along the road to the cemetery and then take the trail up from there. Go straight, always straight, straight, straight – pa’ rrrecto, pa’ rrrecto, pa’ rrrrrrrrecto! It sounded easy and so we started out. The path was very steep, going straight up the slope of the volcano! And we were walking in a thick mist, sweating like mad. But slowly-slowly, step-by-step, we made it to some old collapsed shelters at around 3400 m. Here….the trail stopped! We tried to follow some faint traces of trails higher up the steep slope but there was nothing resembling a proper trail and they all ran out in the vegetation. So there we were, just 500-600 m from the top but without a trail and surrounded by thick mist……we decided to turn around and go down again thinking that if we got lost and could not find the trail back down then we would never get through the thick jungle at the lower slopes of the volcano. 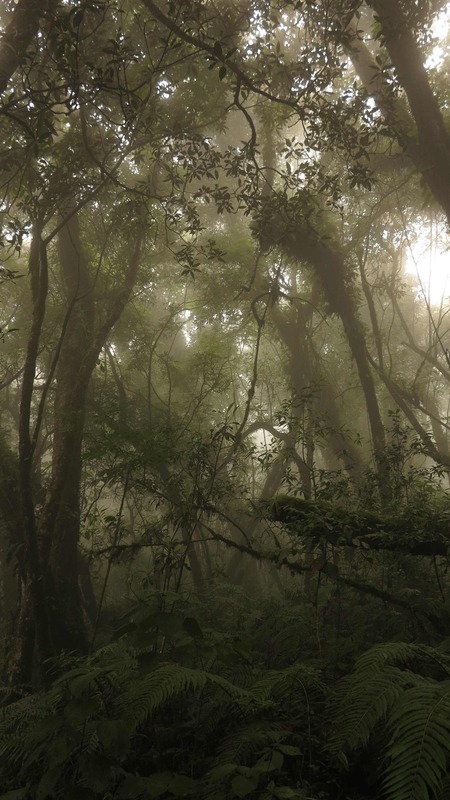 A dense gren jungle envelopes the lower slopes of Volcan Acatenango. In the thick mist it looked magical. Was this really the right trail? It was straight and very easy to follow, but why did it not continue to the top? Almost down at the village we passed through the corn fields again and a young man came to us and asked, why we went that way? It is very steep! We had to agree with him on that. But which other trail to take? Ah but the other trail runs over there, it is much easier with switchbacks and resting areas and is well marked all the way to the top! You just have to TURN LEFT down by that corn field! #@$*! @$ so we marched down to the car, quite upset that we took the wrong trail and also upset with the old guy who told us to go straight, straight, always straight! Next morning in Antigua we looked up at the volcano and saw a clear blue sky, not a cloud. The weather forecast showed the same for the next few days. It was too hard to resist, we had to try again! Second attempt: So the day after we woke up at 4.30 am and were on the road at 5 am. 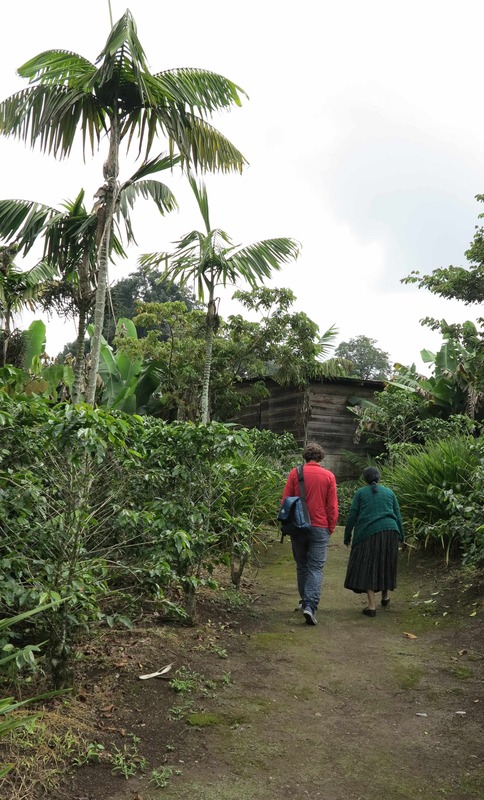 This time we had found a slightly better road to La Soledad, we arrived at 6 am and found the old guy there again. Aaahhh you took the very steep trail going straight up, then you made a mistake! But, we said, you told us to go straight, straight, always straight. Yeeeees, you have to go pa’ rrrrrrecto and follow the trail to the left around the corn fields!!! Ok, no reason to argue, the trail to the left was obviously considered as being the straight trail to the top. Pa’ rrrrecto pa’ rrrrecto pa’ rrrrrrrrecto!!! The guy had the most magnificent r’s! 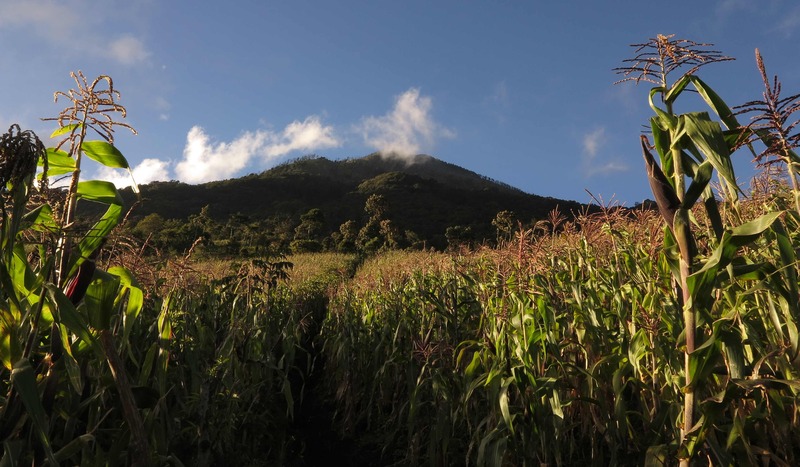 The first time we took this trail, going straight up through the corn fields towards the volcano. A mistake! And so we headed up through the corn fields and the bean fields again but this time in very good weather and with the volcano visible in front of us. We turned left at the advised intersection and found the right path! It was a pleasure to walk to the top. After 3.5 hours of walking the ca 1650 altitude meters up, we arrived at the summit at 3976 m with a fantastic 360 degrees view to the valleys below, to the Volcan de Agua to the west and to the Volcan de Fuego just to the south. It was brilliant! 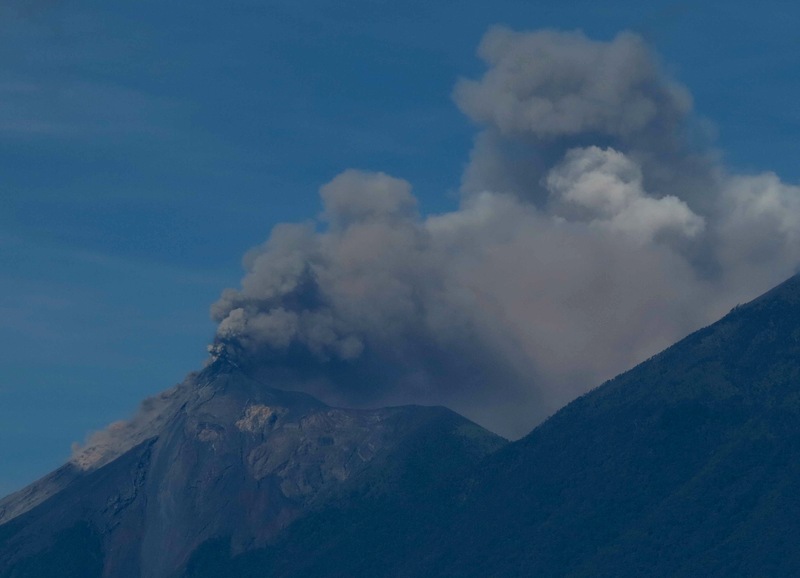 Just as we arrived at the top, Volcan de Fuego gave a nice “puff” of ash to welcome us. We sat down for about an hour, waiting for the big eruption, but Fuego stayed quiet, making only small puffs. Little did we know that less than 24 hours later the Fuego volcano would enter into the biggest eruption since 1999 and we would be watching it from the roof terrace of our hotel in Antigua! 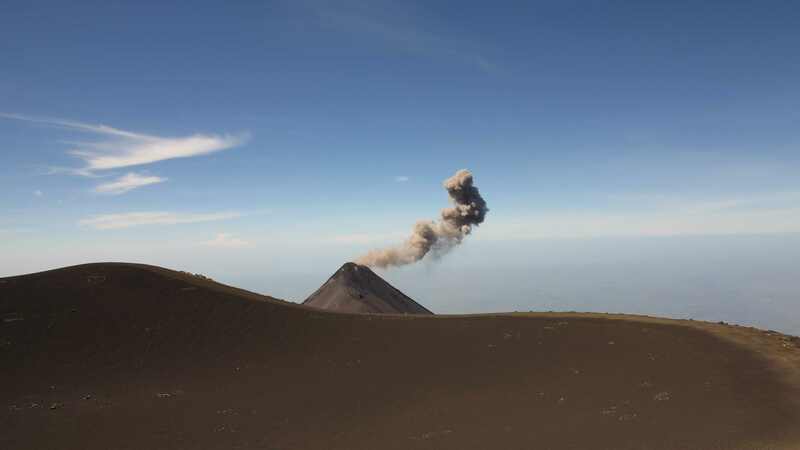 Volcan de Fuego on 12 September 2012 as seen from the top of Volcan Acatenango. From Antigua, one can arrive to La Soledad by two roads. Each road takes about one hour to drive but #2 is definitely better quality! #1 – the bad road: From Antigua, drive southwest towards Ciudad Vieja. Just after Ciudad Vieja, there is a cross road with a left turn towards Alotenango and a road going straight towards San Miguel. Go straight towards the village of San Miguel, 3 km down the road, continue straight through the village and you will find that the cobblestone street turns into a dirt road, which goes up to La Soledad. After a long and bumpy ride, mostly up, the dirt road ends in a T-intersection. Turn left, go through the small village there and the next village you meet is La Soledad. #2 – the better road: From Antigua, drive northwest out of the city, through Jocotenango and Pastores, and then turn left towards Parramos. In Parramos, turn left around the central square and continue on this road out of town. At one point, the nicely paved road turns into a dirt road but not as bad as option #1. Go straight, avoid taking the right turn into a small village along the road, pass straight where the bad road from option #1 goes down to the left, and finally you will arrive to La Soledad. In the village of La Soledad, continue until a road turns sharply down to the right, right there is a bus stop and a small kiosk with a nice big parking area in front. Park by the kiosk and pay the owner of the house to watch the car while you are gone (the going 2012 rate was 20 Q). To find the start of the trail, walk back the way you just came until you see the small cemetery up the hill to the right. Take the well used trail which runs up the volcano to the right of the cemetery. La Soledad lies approximately at an altitude of 2400 m.
Marco at the “obvious” left hand turn! For our first attempt, we had continued up the trail straight ahead. A mistake! You must continue on this trail past one smaller trail going left, then an intersection with trails going both left and right, and finally you must take the third left turn. Follow this trail around the corn fields, it winds its way right, then left and right again, until finally you will see a small wooden hut just before the end of the fields and the beginning of the forest. Next to the hut is a large tree with a hollow trunk. This is where the well marked switchback trail to the summit starts. From here you just can’t go wrong. 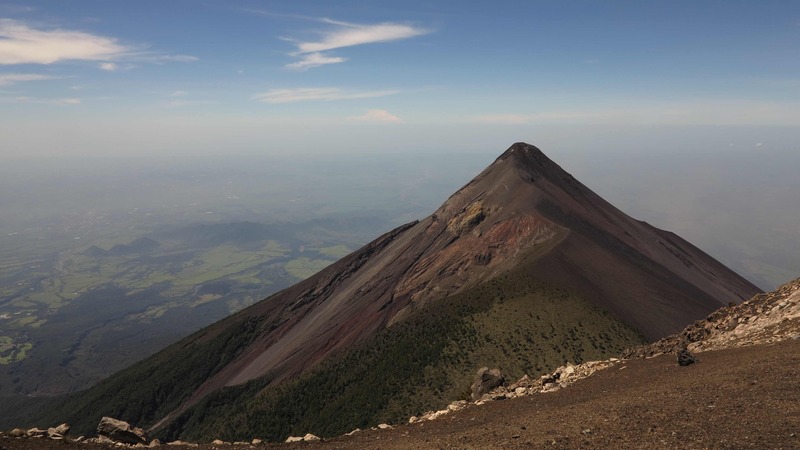 There will be resting areas, small signs marking special types of trees, and really close to the top there are also two signs pointing towards “VOLCAN”! Bring lots of water and some warm clothes for the potential cold winds on the top – and enjoy! 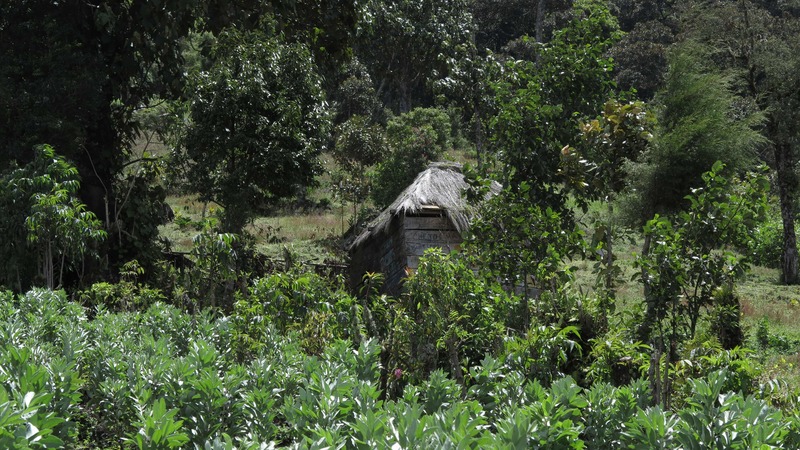 The small wooden hut at the beginning of the right trail to the summit. On the morning of the 13 September we had our breakfast on the rooftop terrace of the hotel as usual. Suddenly we saw a lot of smoke and ash coming out of Volcan de Fuego. It was a fantastic sight. With the bare eye we could see huge pieces of lava being thrown hundreds of meters up into the air and a small lava stream was flowing down the flank. Marco went to get the binoculars so we could see everything clearly. This went on for a while. Luis, the owner of the hotel Posada San Sebastian, came up to have look and told us that Fuego usually erupted like this every 6-8 months and it would probably last a couple of days. 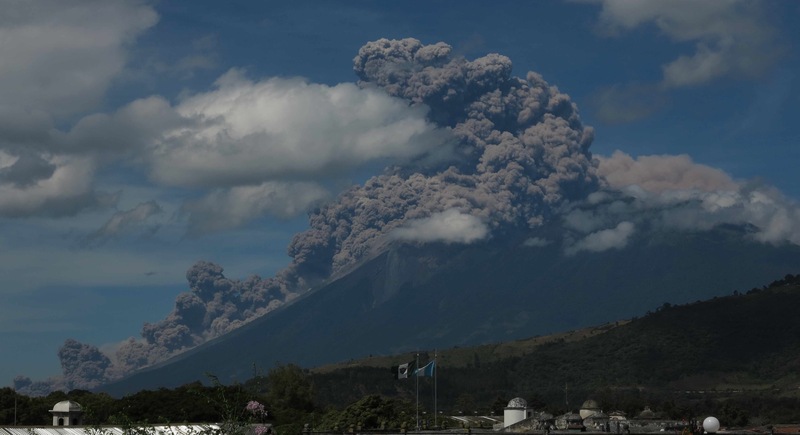 A “normal” eruption of Vocan de Fuego as seen from Antigua. Then very quickly the eruption developed in a much more catastrophical way. An enormous dark grey ash cloud burst out of the summit crater and at the same time we saw a hot gas and ash cloud moving extremely rapidly down the flank of the volcano to the valley floor. The catastrophic eruption of Volcan de Fuego on 13 September 2012. It was an incredible thing to witness, but 33000 people had to be evacuated from their homes at the foot of the volcano. Fortunately, Antigua was at a safe distance to the Fuego volcano. See more pictures on the photo page for Guatemala! Congrats!!! very very nice pics and trip!!!! Enjoy a lot and take care!!!! I’m really happy that you are doing this together!!! Cheers!